The long-standing practice of annually evaluating employees based on their productivity, overall improvement and achievement of goals is one of the areas undergoing a big transformation. For decades, the prevailing wisdom has been that one annual review at the end of the year is enough to let employees know how they’re doing. However, this is no longer true – employees are demanding more frequent and detailed feedback on their performance, and managers are responding by making their review practices more flexible and engaging. 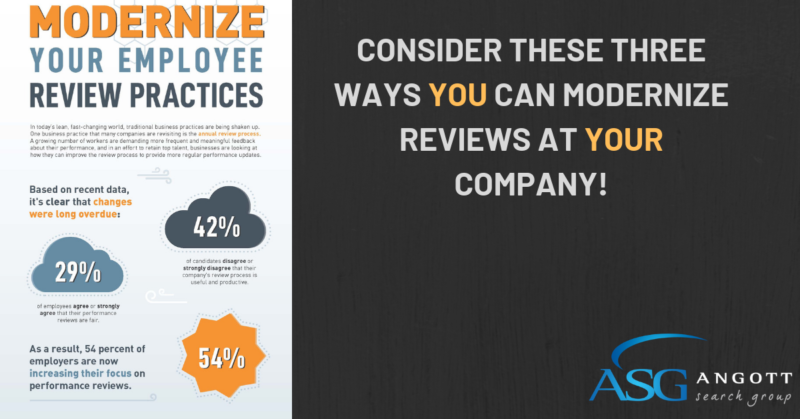 If your company hasn’t updated its performance review practices, it runs the risk of losing top talent to competitors that build regular feedback into their business functions. You’re also missing out on valuable opportunities to identify and develop your employees’ professional skill sets. Career pathing is a strategy that actively invests in and develops your employees to thrive in their current and future roles. It is an intentional approach as opposed to a reactive one – instead of managers passively learning of an employee’s goals at the company, they take a participatory role in professionally developing the individual. Through career pathing, managers and employees sit down and discuss the employee’s professional aspirations at the company and then set a tangible plan for helping the employee reach these goals. Reviews that benefit both the employee and the employer are based on honest, open communication, and this is only possible when there is a culture of workplace transparency. Employees should feel comfortable expressing their concerns, and criticism should be communicated in a way that is constructive. If employees feel that they are always one misstep away from being fired, or that their managers are not honest with them, reviews are more likely to further cement negative feelings instead of paving the way for constructive performance augmentation. Company leadership can do their part to create an open culture of feedback by keeping employees in the loop on workflow changes, encouraging employees to voice their concerns and recognizing workers who aren’t afraid to ask for help.